“Make no mistake: This book is a paean both to the brand and its creative director. But it captures a piece of history that turned the tide of fashion starting in the last years of the 20th century, simultaneously raising the bar that much higher for designers and fashion houses in the new millennium. The premise of the book is to celebrate Mr. Jacobs’ 15th year at Louis Vuitton as well as the exhibit at the museum of Les Arts Decoratifs. It accomplishes the former and the latter as well, but in a more circuitous manner. Louis Vuitton / Marc Jacobs does not offer any photos from the exhibit but instead affords us a much needed look into the heritage and founder of the brand as well as a somewhat overexposed story and about its creative director. The first segment is all about who Louis Vuitton was, an exploration of the genesis of the brand, and what comprises the DNA of the brand. This first half of the book is amazingly interesting for there is very little attention paid to the brand’s roots elsewhere, overshadowed as they are by the brand’s resurgence under its latest creative director’s stewardship, as well as its aspirational and commercial position within today’s designer marketplace. This historical text is lushly illustrated with either photos or sketches or reproductions from the birth of the Louis Vuitton brand and how it came to be known today. Included in the history is a chapter about how fashion dictated the growth of the business—but keep in mind that there was no apparel until 1997 when Marc Jacobs came to Paris. His arrival was almost 150 years after the founding of this ubiquitous luxury brand. 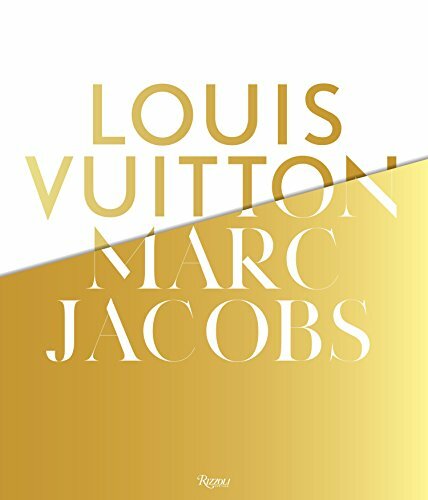 As is expected, the somewhat larger share of the book is devoted to Marc Jacobs, hired by LVMH’s CEO Bernard Arnault in 1997, catapulting a sleepy luxury brand into a mega powerhouse luxury brand that became the benchmark success for all brands that followed. It is no surprise that Mr. Jacobs is lauded in almost reverential tones, but the book does offer the reader a truly behind the brand scenario of what it’s like to be Marc Jacobs and to be part of his team. In this second half of the volume we are treated to a glimpse at the collaborations that have marked the tenure of Mr. Jacobs, as well as the irreverent and evolving advertising that has become part of the vocabulary of Louis Vuitton. Make no mistake: This book is a paean both to the brand and its creative director. But it captures a piece of history that turned the tide of fashion starting in the last years of the 20th century, simultaneously raising the bar that much higher for designers and fashion houses in the new millennium. Louis Vuitton / Marc Jacobs: In Association with the Musée des Arts Decoratifs, Paris is lavishly illustrated with every conceivable type of art that can accompany a book of this nature. It is a book to peruse visually, read carefully, and admire from afar. It makes clear that Louis Vuitton owes much of its resurgence to the iconic and imaginative Mr. Jacobs.